Successfully Added Dual-DIN Car DVD Player - Fits Numerous Ford Cars, Android OS, Octa-Core, 4GB RAM, Bluetooth, 3G&4G, GPS, CAN BUS, Google Play to your Shopping Cart. 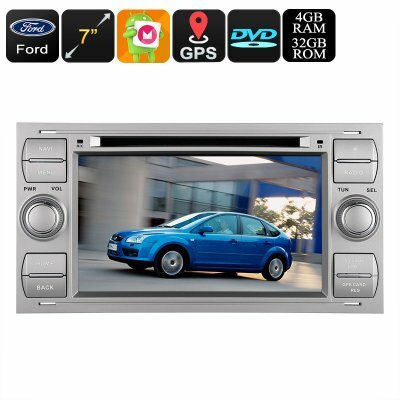 Bring the power of Android into your Ford with this 7-Inch Dual-DIN car DVD player. This Android Media Player is suitable for a number of different Ford cars and is guaranteed to treat you to an unlimited media experience. From now on, you’ll be able to entertain your kids and passengers throughout the trip, guaranteeing that not a single moment of boredom will ever enter your vehicle again. Simply slide in the DVD of your liking, and your passengers will be able to enjoy the film in crisp 1024x600p HD resolution. Your car media player furthermore comes with four high-quality 45W speakers for great audio, thus assuring an outstanding audiovisual experience. With its Android 8.0.1 operating system, this Dual-DIN car DVD player is so much more than your regular car entertainment system. It allows you to play games, watch films, and even engage in the latest Android Apps. With WiFi and 3G&4G dongle (not included) support, you’ll be able to browse the web at any given moment. This allows you to download the latest media through the App store or to simply visit the websites of your liking. Thanks to its Octa-Core CPU and 4GB RAM, this car DVD player is fit for tackling the latest software features out there without dropping a frame. This car DVD player treats you to 32GB internal storage. Additionally, it lets you insert external media via its USB and TF card slots. With Bluetooth connectivity, your Android Media Player can even be connected to your phone. This allows you to listen to songs and engage in hands-free phone calls while on the move. This 7-Inch car DVD player is easy to connect and supports CAN BUS for easy usage. To further increase your user experience, it comes with a highly accurate 20-channel GPS navigation system that makes sure you’ll never get lost again. This 2-DIN Car DVD Player comes with a 12 months warranty, brought to you by the leader in electronic devices as well as wholesale car media players..